The GENESIS3 is ideal for the professional or project recording studio, it places all the GENETX sound creation and processing flexibility in a compact desktop unit. The GENESIS3 includes a knob based editing interface, eight segment display, stereo outputs, and 48 user and 48 factory presets.The SPDIF digital output provides a direct interface for recording in the digital domain. The Dry Track feature taps the signal before the effects processing and sends it out the SPDIF output while effected signal can still be monitored out the 1/4" outputs. The MIDI capabilities provide easy computer- based editing functions, and virtually unlimited preset storage. 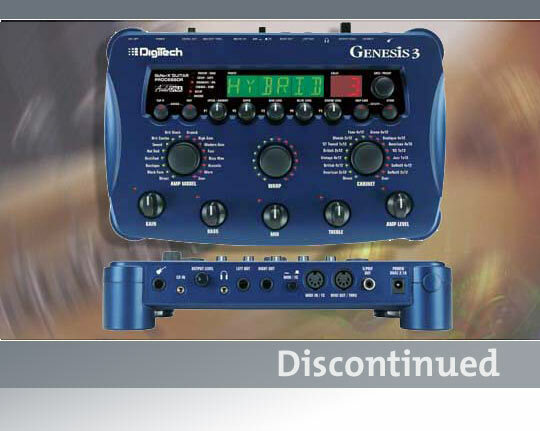 The Genesis3 can be quickly converted into a live performance piece with the addition of the optional DigiTech Control X foot controller. Signal to Noise Ratio Greater than 101dB (A weighted); ref = max signal, 22kHz measurement bandwidth. Dimensions Width 10.5" x Depth 6.6" x Height 2"
GenEdit will not connect with my Genesis3. the midi in of your computer.